Renovated in 2011 this lovely former farmhouse sits in a beautiful cottage garden with off road parking and bright, modern, family accommodation which sleeps up to 7 people. With 3 bedrooms, 2 bathrooms, and a large open plan living area, the property also benefits from a large outdoor summerhouse. Ideally located for village amenities, beaches and golf course in the popular village of Morfa Nefyn, the cottage is only a short drive to the popular town of Pwllheli and is also close to the fashionable shops, bars and restaurants of Abersoch. Our normal changeover days are Friday and Monday, we can consider alternative days at less busy times of the year but please enquire before confirming a booking if you require different days. Based in Manchester my husband and I have busy schedules with work and spend a lot of time travelling, so we like nothing more than to escape to the peace and tranquility of the Lleyn Peninsula whenever we can, its an amazing part of the country. We purchased Cae Ifan in summer 2010 after a long search for the right property. The cottage had been rented out or left empty on and off for a few years and was in a pretty sorry state! We spent just less than a year completely renovating the cottage and we are really pleased with the final result which has given us a modern, comfortable family cottage whilst still retaining the character and charm of the original building. Apart from the obvious appeal of Cae Ifan as a quaint holiday cottage its location was perfect. Right in the heart of the village of Morfa Nefyn we can walk to the local shops in a matter of minutes, but our favourite thing about it is that we are right in the middle of the two beaches at Nefyn and Morfa Nefyn and can walk to either beach in 10-15 minutes which is absolutely great we love it! We spend a lot of time at the cottage ourselves and for that reason we try to make sure that every possible comfort and convenience is catered for. We are very lucky to have a lovely, private garden which makes Cae Ifan a really special find. We look forward to sharing it with you please email your enquiry or just give me a call to discuss your requirements. En-suite bathroom to bedroom 1 with shower. Main bathroom with full size bath and electric shower. Both bathrooms have underfloor heating. All bed linen is included as well as bath mats and tea towels, but please take your own towels and beach towels. Private Drive with space for two cars. Large open plan living/dining area with comfortable seating. Wood burning stove, flat screen TV with Freesat, DVD player. Shelves with books, magazines and games. Fully fitted kitchen with Belfast sink, oven, halogen hob, fridge freezer, microwave and dishwasher. We have a range of books and board games which you are welcome to use during your stay. Large cottage garden with summer house, garden furniture, and swings. The cottage is just a few minutes by car to the renowned 27 hole Nefyn and District Golf Course with stunning sea views. Notes on accommodation: The property has no gas supply so is heated by electric panel heaters, these can be individually controlled and all have timers. The bathrooms are heated with electric underfloor heating systems. The main living room area has a multi fuel stove. Outside: Large summerhouse with children's games, patio with table and chairs. Smaller summerhouse to the rear of the property for extra storage of bikes etc. Lovely cottage style garden and gravelled driveway. Utility Room: Small kitchen area with second sink and washer dyer, iron and ironing board. We also have a travel cot, high chair and todler chair if needed. Cleaning / Towels / Linen / Maid service: All bedlinen, bathmats and tea towels are included but please bring your own towels/beach towels. Other: Beach Hut on Nefyn Beach available to use May - mid September - please ask for details. WiFi available. 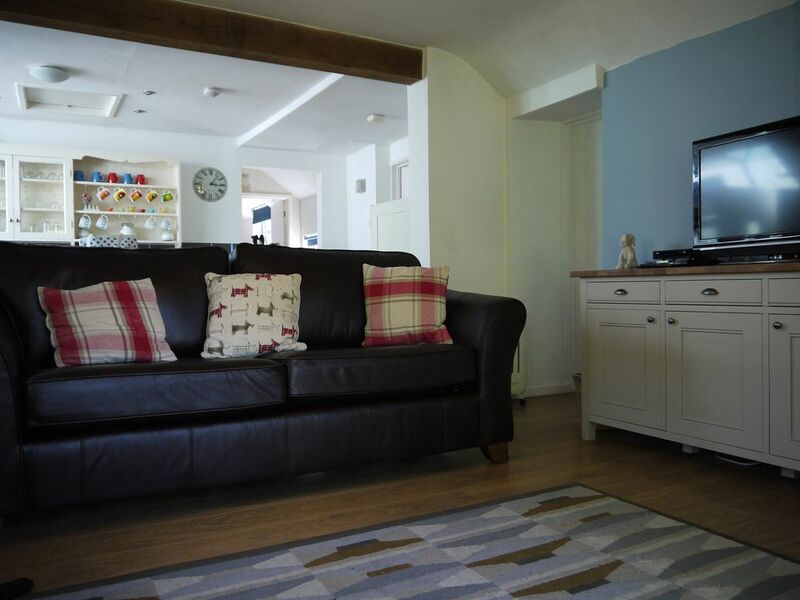 Cae Ifan is a lovely cosy cottage - everything the Llyn Peninsula has to offer is within easy reach. Catherine the host provided a wonderful welcome pack with everything we needed to make the most of our stay. Really enjoyed our short break in this lovely cottage. Very homely and great location for access to the coastal path. Perfect holiday retreat away from the hustle of life! Fantastic weekend at beautiful cosy cottage. Prime location for visiting all that the Llyn Peninsula has to offer. All needs catered for within the cottage and fantastic child/pet friendly garden. Would definitely recommend this charming cottage and well done to the attentive owner who answers any queries straight away. Spent a long weekend at the cottage. It is clean and after having the heating on and the log burner going it was lovely and warm. Great location to reach the beaches, unfortunately we only made it to Morfa Nefyn beach as the weather was very wet and windy for the duration of our stay. But we managed to get out in the car and visit a few places. Lots of games to keep my little boy entertained too. Thank you for a lovely stay at your cottage Catherine. Cae Ifan is a great house, well equipped and cosy. Made full use of the log burner. It is very close to the beaches and the coastal walk is great. Morfa nefyn is a great base for exploring the llyn peninsula so I would recommend to anyone especially families. We loved staying at Cae Ifan. The cottage is cosy and homely which was just what we wanted. It is conveniently situated about 15mins walk from Nefyn and 20mins to Ty coch (walking with children). There is a brewery about 5-7mins walk away so the cottage is central for most things. We used the car to go a little further afield twice! Communication with Catherine is spot on; there if needed but not intrusive at all. We have been to the Llyn for many years and this is the best place we have stayed by far. Close to a large selection of beautiful beaches and scenic coastal walks. Just 10 minutes walk to the beach at Morfa Nefyn and Nefyn, and a pleasant stroll along the beach takes you to the popular Ty Coch Pub! Morfa Nefyn 1/4 mile. Nefyn 1 mile. Pwllheli 6 miles. Llanbedrog 9 miles. Abersoch 12 miles. Booking Notes: Please email your enquiry to callsop@outlook.com, or call me on 07974 219905 to check availability and best prices for your required dates. We just request £150 deposit at the time of booking, and the balance due 8 weeks before your stay. If you are booking less that 8 weeks before you stay then the full amount of the rental will be payable at the time of booking. Changeover Day: Normal changeover day for a weeks holiday is Friday, although this changes to Saturday for the main summer holidays when full week bookings are preferred. Weekend or mid week breaks changeover on Friday or Monday, please contact me to discuss your specific requirements we try to be flexible for non peak season bookings. Notes on prices: Mid week breaks and weekend breaks are available on request, please contact us for prices and availability, just drop me an email, or call me to discuss for your initial enquiry - callsop@outlook.com. One or two well behaved dogs are welcome but there is an additional charge of £20.00 per week for the extra cleaning costs. Please advise if you will be bringing pets when you enquire.